Years in the making, this classic design has been improved even more by ice fishing legend Dave Genz. Dave has made his Blue Box" nearly indestructible so it will last for years of hard use. Genz redesigned the battery storage compartment and added a universal transducer holder system. 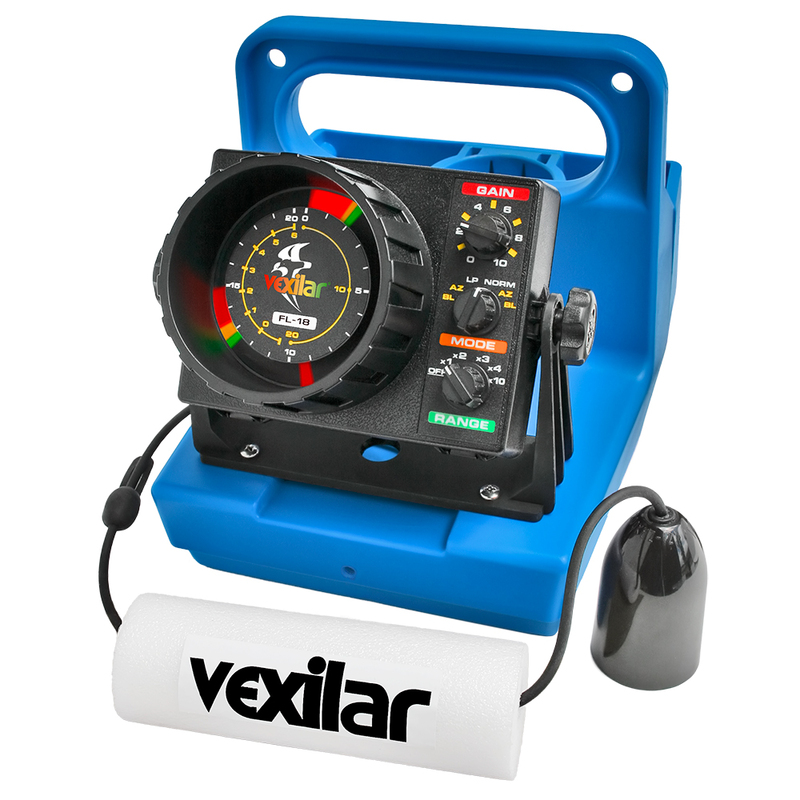 The Blue Box can also accept the full line of Vexilar accessories like a Battery Status Indicator, Vexilar Flex Light or even a Dual Beam IceDucer transducer. The Blue Box fits on top of a five gallon bucket for easy access and handling while fishing. Available with the Vexilar FL-18 or FL-8se. Each Genz Pack Combo comes with a 12 volt, 9 amp-hour battery with charger and an Ice-Ducer transducer. The Genz Pack comes completely assembled and ready to fish with. It also includes an instructional video. The FL-18 boasts features and performance previously not available on a three-color flasher depth finder / fish finder. The FL-18 offers a patented split screen flasher display. This allows you to zoom-in on the bottom six feet while watching the entire water column at the same time in real time! You will be amazed at the performance for bass fishing, walleye fishing, and pan fish on both open water and ice fishing. The Bottom Lock feature stays locked on the bottom even as the boat is bouncing up and down in big waves! The Auto Zoom mode is fantastic for watching Perch or Walleye while ice fishing. These fish commonly hold tight on the bottom, and with a target ID of less than 1/2 inch, the FL-18 makes them easy to spot! And that's not all. The FL-18 depth finder / fish finder is equipped with features like a built-in shallow water mode for fishing waters under 15 feet. Five depth scales down to 200 feet for the standard model. Built-in interference rejection. A three color LED readout that tells you if the targets you see are weak (green) medium (orange) or strong (red). This three color LED technology has proven to be the most reliable and accurate way of understanding where fish are holding. Bottom Lock Mode (BL) - Works the same as Auto Zoom, but locks the bottom so it will not move with changes in depth or boat motion. For use in open water only. Super Bright and Rock Solid Display - The Light Emitting Diodes along with a high power driver circuit and a screaming fast wheel speed gives the FL-18s display unmatched brightness and signal clarity. Five Depth Ranges - The Standard FL-18 includes 20', 40', 60', 80', and 200 foot ranges. The Deep Range unit includes 30', 60', 90', and 120' foot ranges. Dimensions: 4.4"H x 6"W x 2.5"D - Weight: 12 lb.